This recipe makes the perfect crunchy, buttery caramel corn. It is perfect for a party and just like what you get at the baseball stadium. The best part is you can make it ahead! When we decided to throw a baseball themed baby shower for my little sister, we knew we had to have all of the bases covered. (Ha! See what I did there?!) We needed peanuts, hot dogs and nachos. We needed plenty of penants and of course we needed caramel corn. After all, you can't have a day at the ballpark without something along the lines of Cracker Jacks, can you? I was immediately volunteered for the role of caramel corn maker. I have been making my husband's grandma's recipe for the last few years and it is always a hit. I knew I had all of the ingredients on hand, so I didn't worry too much about it. That is until I went to make it! You see her recipe starts the way you'd expect to make caramel corn. You mix together brown sugar and butter and all of the goodies to make a caramel. Then you pour it over the popcorn... but that is where the familiar part ends. She puts it all in a brown paper grocery sack, gives it a few good shakes and finished it in the microwave. You take it out to shake it a few times and then spread it out to cool. 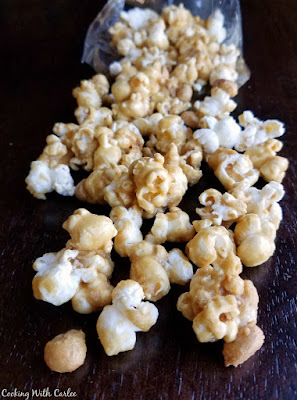 The result is that perfectly crunchy caramel corn you'd expect when trying to emulate a box of ballpark famous Cracker Jacks. So I went to the cabinet where we keep the paper bags and it was bare! We almost always bring cloth bags to the grocery store, but I try to remember to get paper bags while we are there every so often. I do like to use them to keep track of the paper for the recycling bin and of course to make an occasional batch of caramel corn. But it looked like the recycle bin had been the lucky recipient of the last bag... and I needed to make caramel corn!! That's when it hit me. 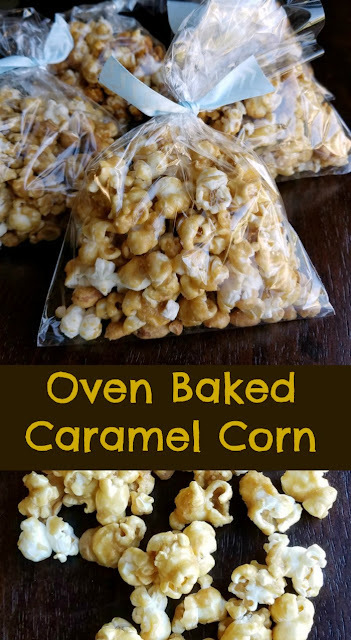 Linda (of carrot cake fame) makes great caramel corn, and she finishes it in the oven. Sure, it would take a bit longer but I knew the results would be fabulous. When I used to live nearby, she'd have to make an extra batch if she knew I was going to be around. The stuff is so addictive! I love mine with plenty of peanuts and within arm's reach! So I made a couple of big batches. It was every bit as good as I remembered it being. I bagged some up for favors and put a bag at each place for the shower. I kept the rest in an airtight container until party time and then put it in big bowls at the center of the tables. People kept reaching for it and had it nearly polished off during the party and it wasn't for lack of options! That's how you know it's good. The best part is you can make it ahead of time if you are wanting it for a party. Just keep it sealed and it will hold for a week or two, or so I've heard. I've never managed to keep it around that long. I know it does keep for at least 5 days. So go ahead and make a batch, or maybe go ahead and make two. You might as well! Preheat oven to 250 F and grease a couple of rimmed baking sheets. In a large saucepan, cook butter, brown sugar, corn syrup and salt until it begins to boil. Boil for 5 minutes, stirring frequently. Remove from heat and carefully stir in baking soda. Pour hot caramel over popped popcorn and peanuts to coat. Spread over the greased baking sheets. Bake for 45 minutes at 250, stirring every 15 minutes. 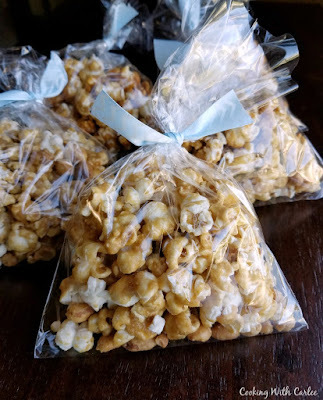 It's was fun to watch the other guests at the shower enjoying your caramel corn. Most were grabbing a handful and talking about how they need to be done eating it only to grab more a few seconds later. "This stuff is addicting. " It really is hard to stop once you get started! I was glad they were enjoying it! This delicious recipe sounds a lot like my mama's. Oh how I love me some caramel corn!!! I wish I had a bag of it to take to work!! Happy Monday pretty lady! Isn't it the best?! I have to say I am glad this disappeared so quickly at the shower though, or I would have eaten way too much of it myself! Yum! And what a fun food to include at the baseball themed shower. Thank you! It was definitely a hit! Oh my Carlee! You have exceeded yourself here. Caramel coated popcorn isn't a thing here so we make our own as you said, by pouring a caramel sauce over popped corn. It's nice but lacks crunch. I will most certainly be trying this recipe, I'm sure my daughter will love it as much as me. I bet your sister loved it! You definitely have to give it a go! It is so good and it does keep much better since it is crunchy and not sticky. I am anxiously awaiting your review! Oh em gee. I LOOOOOVE caramel corn so freaking much. Why does it have to be 10,000 degrees outside here? I'll have to make the microwave version today and wait till it cools down--or until my will gives out--before I make the baked version. This sounds awesome, Carlee! I'll trade you some caramel corn for a slice of your caramel machiatto cheesecake. Ok?! Let's meet half way! It is so hard to stop once you eat that first piece! Carlee you have just bought childhood memories back of Cracker Jacks. I used to devour that stuff. Your version is the healthy gourmet venison. I should have hidden a little prize in each bag to make it just like those boxes from childhood. I wish I would have thought of that before just now! Thanks, Mary! Me too. It's a little embarrassing how much of this stuff I could eat! I love it! It's delicous! Oh the good old days of Cracker Jacks. That brings back some pretty good memories. This recipe sounds delicious. I'm impressed that you thought to finish up the popcorn in the oven. What did people do before microwaves!?! We are kind of spoiled, aren't we? Thanks for sharing this recipe. We are spoiled! I didn't know you could do it in a microwave until my husband came along. Luckily both versions come out delicious! Who doesn't love to munch on some good popcorn :D...And buttery caramelly popcorn is even better!! Definitely need to try this recipe soon :). Thanks for sharing Carlee! Isn't caramel corn the best? I hope you love it! 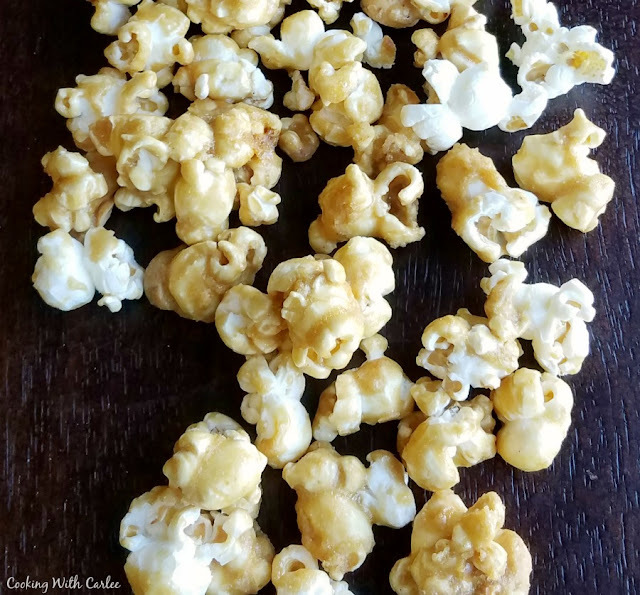 Kind of embarrassed to say this, but I still have never made caramel corn! Maybe it's because I am afraid of eating it all! Seriously though, this sounds delicious! Oh my goodness!!! March into the kitchen and make some right now! The fear of eating it all is real, though. I don't trust myself with a batch unless there is a group to share it with. I sure wish I had some of this for a treat right now! Hope you have a great 4th of July weekend and thanks so much for sharing with us at Full Plate Thursday! Me too, Miz Helen, me too! Have a great 4th! Oh my goodness, you have to try it! It is sooooo good! I must be blind, I do not see the amount of salt. Sorry about that! A pinch or about a 1/4 tsp will do it. There will be plenty of salt from the peanuts as well to give you that sweet and salty flavor.